It is generally accepted that Vaishnavism is very old with Sriman Narayana Himself taking the position of 'Paramacharya' (Piramaguru). 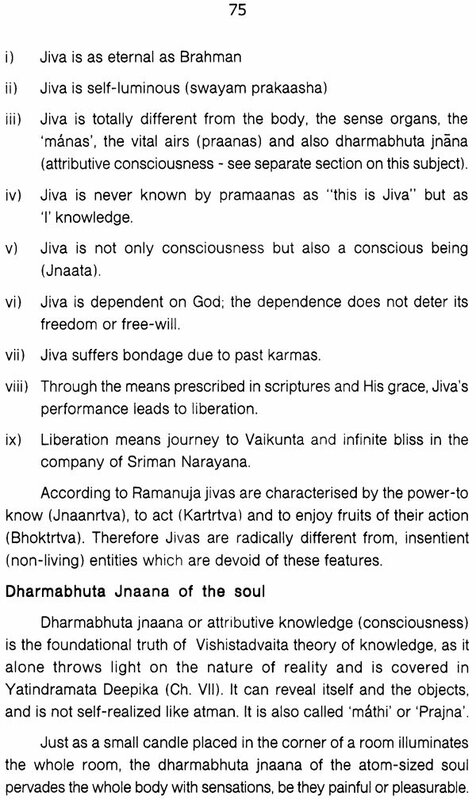 Coming down to recent times, this faith found succour through azwars' Prabhandham compositions ; the azwar, heading the list, is Nammazwar, known as prapanna-jana-kootasthar, with 'prapanna' connoting immediately a route to reach the god-head through 'prapatthimaarga', which has the distinction of being the easier alternative to bhakthi-maarga. While Nammazwar was born at the turn of the yuga, to be precise on the 43rd day of kaliyuga, the last of the 12 azwars, Thirumangai azwar was born in 2804 B.C. All the azwar's sang bhakthi-filled religious lyrics falling under the generic term 4000 Divya Prabhandham. However with time this treasure was lost, lost because the practice of learning them through 'voimozhi' had vanished (learning from mouth of one who had practised it). So there was a very long dark period when Srivaishnava faith and Vishnu bhakthi had taken a beating. Around the end of ninth century a person, who later came to be known as the first acharya, takes birth in Veeranarayanapurarn, Chidambaram district, the present Chennai state. He was none other than Nathamunigal. He was connected with the local temple, Kattu Mannarqudi, doing daily worship to the deity, Veera Narayana Swamy. 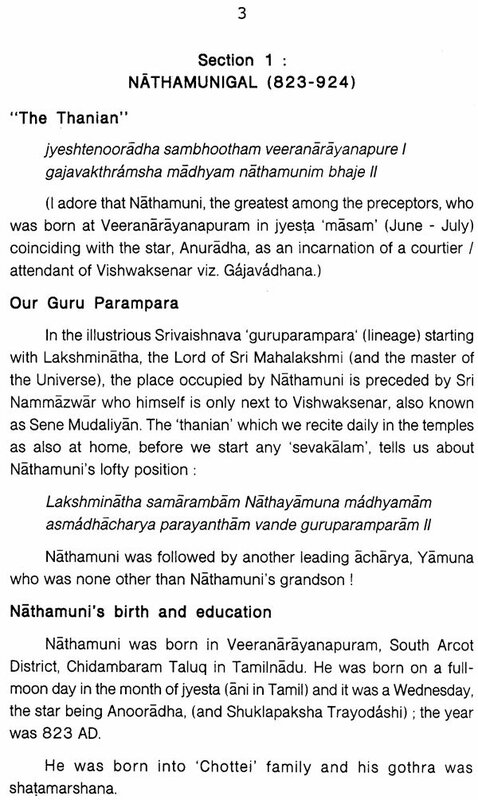 The extraordinary event in Nathamuni's life (for that matter in the lives of all Srivaishnavas) was his careful hearing of ten songs (stanzas) sung by a group of devotees who visited the temple. In the hindsight one might say it is all due to Lord's grace and planning that this took place! The journey for finding the root of the bhakthi-filled lyrics starts, thanks to Nathamuni's undaunted spirit and his utmost devotion to the Lord! Nathamuni's epoch-making and unrivalled saga of bringing to us the 4000 Divya Prabhandham has been adequately covered in this book. 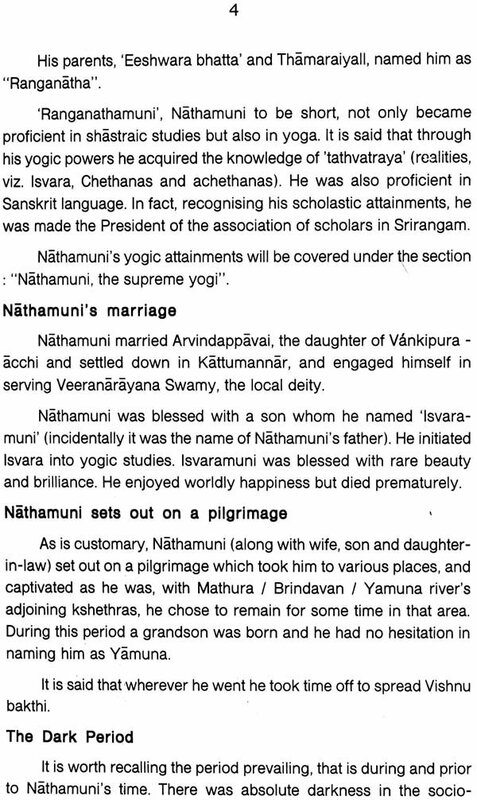 Nathamuni had shastraic knowledge and Yogic attainments traced to Pathanjali Yoga. He set the 4000 Divya Prabhandham into music, being himself proficient in music, and took the help of his two nephews for this vast task. He made special efforts in gathering like- minded people, taught them the dravida veda (4000 Prabhandham) and some of them got instructions in Yoga too. One of the important aspects to be noted is that Natharnuni underwent 'swayam Prapadhana' (Prapatthi), He went on a pilgrimage to a number of holy places along with wife, son, daughter-in-law and others. He remained on the banks of Yamuna for a long time and when a grandson was born to him, it was no wonder that it was named "Yamuna". 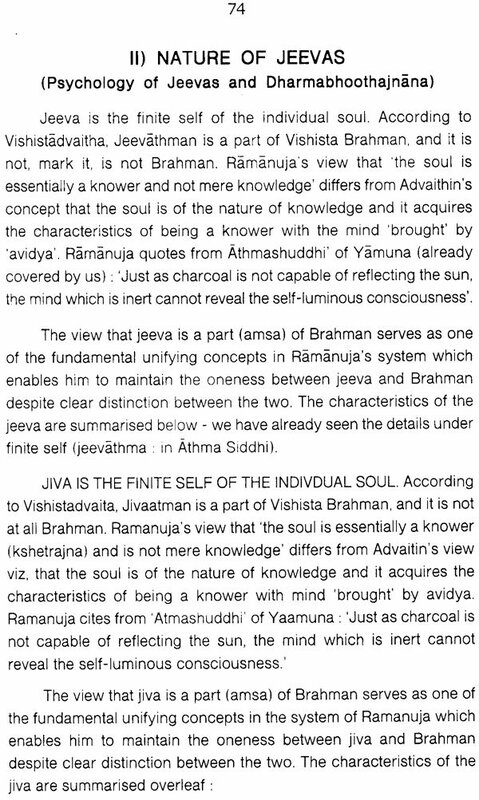 Yamuna occupies the second place in the acharya lineage, and his life and works are also covered in the second section of this book.